Could the Next Pope Be Asian? Manila Archbishop Luis Antonio Cardinal Tagle is the Philippines’ hope for a homegrown pope. Over the weekend Marbel Bishop Dinualdo Gutierrez reportedly implored his Filipino Catholic flock: “The conclave is a sacred rite. It’s improper to trivialize it by betting.” This hasn’t stopped people in the Philippines and indeed from around the world from indulging. While this betting is nothing new, the presence of serious papal contenders from Asia, Africa and Latin America is a development worth noting at the 2013 papal conclave. Pope betting is the religious equivalent of betting on the races, with bookies and punters worldwide throwing down money on papal contenders of choice. While it’s illegal in many places, including the United States, in others the gambling can be fierce. If the last papal race in 2005 is anything to judge by, the bettors are usually close to the mark. In April 2005, one day before Benedict emerged from the white smoke as the new pope, Irish novelist Frank Delaney wrote an op-ed in The New York Times pinpointing three contenders selected on the advice of bookies. Benedict was among the three. Following Pope Benedict’s resignation last month – the first in 600 years – the betting swiftly commenced. Irish online bookie Paddy Power has vetted a list of around 90 papal candidates compiled by Oddschecker.com. In 2005, Paddy Power raked in more than U.S. $1 million in Pope bets and gave Cardinal Ratzinger (who took the name of Benedict) 3-1 odds. A few hundred punters even tipped Ratzinger to take the name of Benedict as Pope. Their findings: At age 71, Archbishop of Milan Angelo Scola (described by Matthew Bunson as having “the intellectual chops for the job”) has the best shot of becoming the next pope, with a 23 percent chance, while Peter Turkson of Ghana, aged 64, has the next best odds at 22 percent. Others near the top include 78-year-old Tarcisio Bertone (Italy, 16 percent), Canadian Marc Ouellet (12 percent) and yet another Italian Angelo Bagnasco (10 percent). A list of top contenders can be found here. This time around there is a marked trend towards diversity, with Turkson an obvious example. Many speculate that the next pope could come from the developing world, particularly Africa. The College of Cardinals “presents a variety of faces, because it expresses the face of the universal Church,” Pope Benedict said during mass at the Vatican on November 24. While not as likely, some hope that the next leader of the Church could be Asian; in particular, Filipino. With a Catholic population of roughly 76 million, the Philippines are the largest Christian nation in Asia and the third-largest Catholic nation in the world. One interesting possibility is Manila Archbishop Luis Antonio Cardinal Tagle. At only 55 years of age, he donned a red cardinal’s biretta and a gold ring to become the second youngest “Prince of the Church” (cardinal) last November. 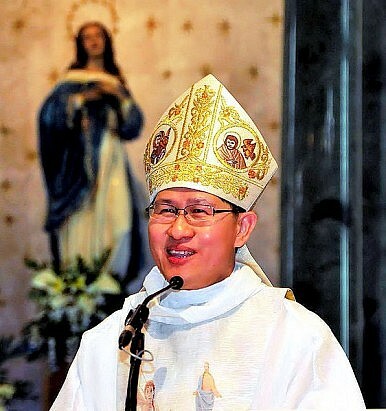 Tagle, perceived as humble, charming and well-connected with Benedict, has been called the “Great Asian Hope” by CNN senior Vatican analyst John Allen. “One could make a pretty strong argument that nobody’s chances of becoming the next Pope benefit more from Benedict XVI’s resignation than those of Cardinal Luis Antonio Tagle of Manila in the Philippines.” Allen wrote in an article posted on the website of the National Catholic Reporter. Alas, Tagle’s relative youth may keep him from the papacy this time around. Still, it keeps him in the running longer term. For Filipino Catholics who keep the faith, there’s always next time.